Escaped beavers loose in parts of Tayside are to be recaptured as a "matter of urgency". Scottish Natural Heritage (SNH) believes up to 20 feral beavers have escaped private collections in Angus and Perthshire. The animals will be trapped and then passed onto the Royal Zoological Society of Scotland to be "re-housed". A trial reintroduction of beavers is currently under way at Knapdale in Argyll. SNH said the decision to recapture the animals was taken following agreement between members of the National Species Reintroduction Forum. Trapping will take place in collaboration with Tayside Police and local landowners. 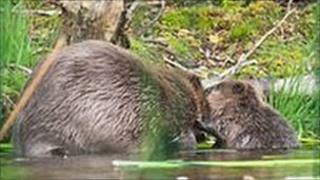 The beavers are being recaptured because it is illegal to allow their escape or release into the wild and because their welfare may be at risk, SNH said. A spokesman for the organisation said unauthorised releases of beavers would "subvert and undermine the position that Scotland carries out reintroductions according to best scientific practice". He added: "The longer we leave the feral beavers in the wild the greater the task of dealing with the problem will be. "We are also urging all owners of animal collections to take greater care in keeping their animals captive. "No final decision has yet been made on whether the European beaver should be reintroduced to Scotland." SNH is monitoring the Argyll trial and will report back to the Scottish government in 2015 on whether the species should stay in Scotland.